"Harry, give us a wave," they chant to doppelgänger pulling pints. 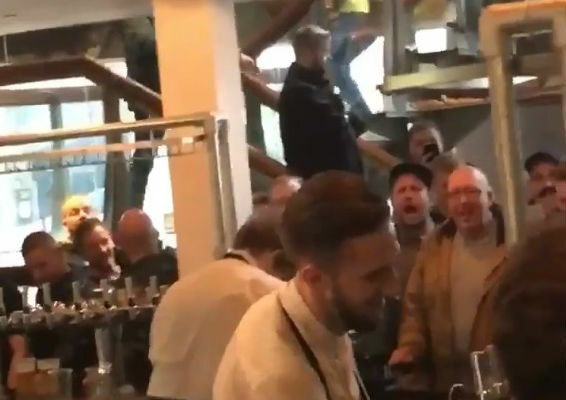 Watch this clip of Leeds United fans singing “Harry, give us a wave” at a barman who looks like Harry Kane. The Leeds supporters were in Sheffield for a Yorkshire derby they would go on to lose 3-0 at Sheffield Wednesday when they noticed the striking resemblance. Tottenham Hotspur striker Kane scored twice at Huddersfield the previous day, taking his tally of goals in September to thirteen after another goalless August. And some Leeds fans might now be under the impression that Kane’s talents have extended to pulling pints in a Sheffield pub. The barman in question acknowledges the chant with a grin and later appears to be explaining it to an unaware colleague. Listen out for one fan who unsuccessfully attempts to initiate a chant of “you’re too s**t to play for Leeds”. An ensuing rendition of “Harry Kane, he’s a w*nker, he’s a w*nker” does a better job of catching on.